EVVA is one of the top high security manufacturers in the world with several different active high security systems and is based out of Austria. We carry their premium MCS (Magnetic Code System) product line featuring a nearly un-duplicable key and an extremely secure cylinder with both an advanced magnetic and mechanical slider security system. MCS locks are completely bump proof and extremely pick resistant (no known picking attacks have been successful). All EVVA locks and keys are factory assembled which is great for key control and security, but also means most EVVA products may have to come direct from the factory. All MCS locks can be keyed to work with the same set of keys. For more details please see our EVVA Brand Information page. We normally stock EVVA locks in the default configuration (default number of keys, default finish, keyed different, etc). Other options/keying/numbers of keys may have to come from the factory (contact us as some items are on hand). Factory orders are generally done quarterly, with our next scheduled order in July 2017, due to quantity demands we may place an order before then. If you need something urgently please give us a call and we can let you know availability (and the factory can always do custom runs but they incur additional shipping charges). Factory orders are generally filled within 3-4 weeks of us placing them. EVVA locks are all keyed at the factory. We are able to have your locks keyed alike(to the same key) without issue. We can also master key(see our Master Keying Page) your locks as you desire. Keyed alike means that if you order two padlocks and a deadbolt(for example) from us we can key them all to operate on the same key. To order two or more locks keyed alike, just select "keyed alike" under keying and all locks in the order will be keyed the same. It is important to note that when keying alike you do not get more keys for each lock you order, just the initial lock's number of keys. This means no matter if you order 2 or 5 padlocks keyed alike, you will only get 2 keys total. If you require additional keys just order extra keys. Master keying can allow you to allow some keys to open some locks and other keys to open all locks. You can specify your desired master keying in the notes area when checking out, or you can simply put a note in to call, and we will call you to discuss your needs. If you require any special keying options or are unsure on the keying just put "please call" or enter additional details in the notes box during checkout and we are happy to help. If you are looking to have locks or keys to a previous order please see our keying page. EVVA Keys can come with colored circles on them or plastic key heads. These items are not possible to add after the fact and must be done at the factory. To order either colored circles or key heads on the keys please see our EVVA MCS cut key page. Any keys ordered with your initial order will be at the discounted key price (adjusted after you submit the order. EVVA keys can also come with electronic inserts for RFID, Prox, or HID applications. Please contact us for more details. For extremely harsh conditions (lots of sand,salt,dirt,etc) EVVA offers an optional heavy duty dust protector to the front of their locks. Note for 99.9% of all applications this is completely unnecessary. EVVA locks are out of the box extremely weather resistant featuring a very low chance of any material actually causing interference in the lock. If you are however in extreme conditions for extended periods of time EVVA offers the dust protector for added protection. For extreme weather conditions (very heavy salt,sand,dirt) you can get an optional external dust cover that will protect the lock from the elements. The dust cover is not needed for 99.9% of all conditions as EVVA locks are extremely weather resistant all on their own. 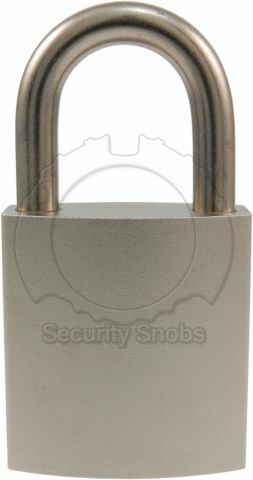 EVVA MCS Non Shrouded Padlock was successfuly added to your shopping cart. You can browse for more products or proceed to checkout.